There are many perks of living on a farm. The space and wilderness, the animals we care for and love, and the good food we raise and share. However, many urban people may think its a slow easy life, like driving a slow moving tractors, watching the slow growing crops, the slow task of cutting hay, but...............watch us harvest garlic. Speed and efficiency and long hours of hard back breaking work, (well not quite that hard) would send a few urbanites back to their comfy couches. But i love this time of year. 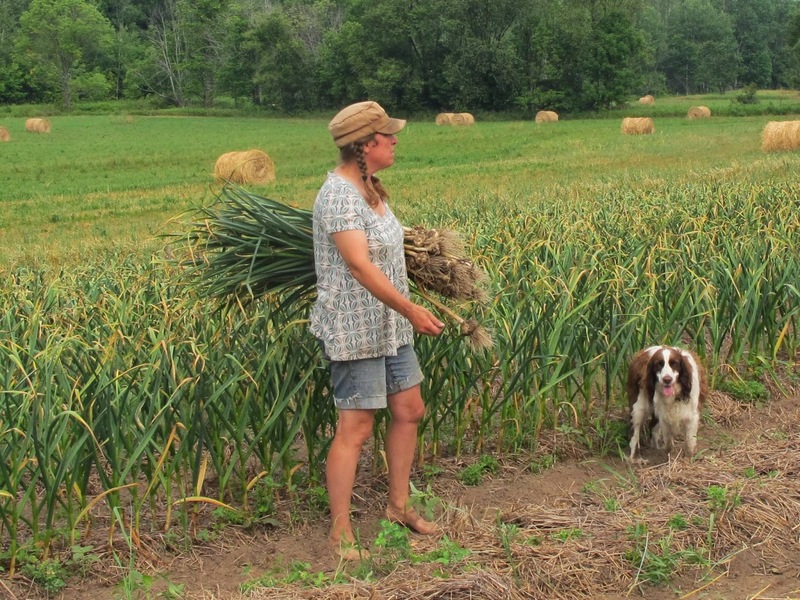 And so i am still thinking of Crop Mob Day for those urban back yard gardeners who would come out to spend a day helping a farmer harvest garlic. You can pick my brain.....share a pot luck lunch and take a walk around my veggie garden. This isn't a entertainment farm, but a working one and sometimes i could use some extra hands. keep watching here for more info as i pick the right Sunday in July.